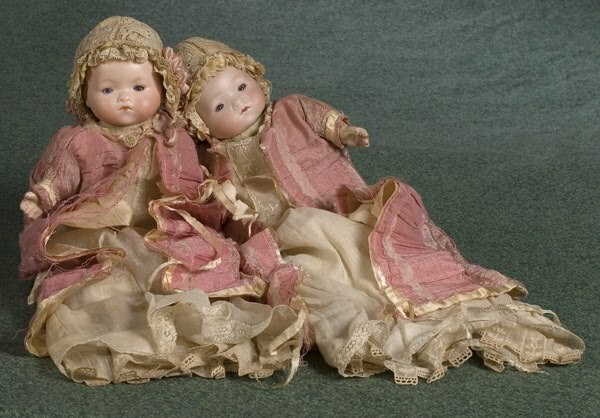 In their own particular world French baby dolls were the greatest triumph of the late nineteenth and early twentieth centuries. 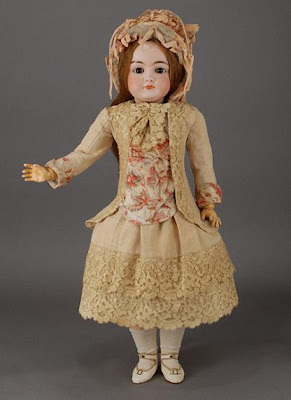 In 1860, there was a surge in the production of bisque dolls due to the popularity of fashion dolls, and thus triggered off an explosion that spread throughout Europe. 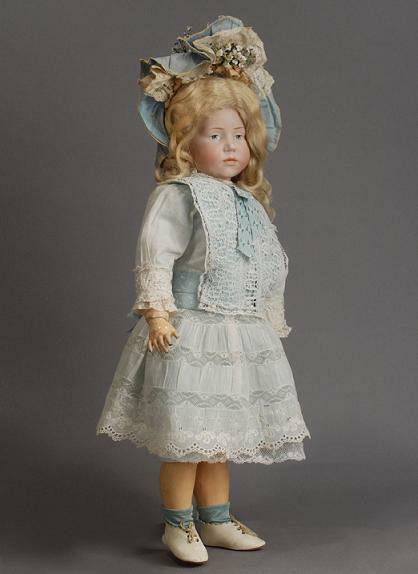 The majority of these dolls were produced in France, though the heads were largely made in Germany. 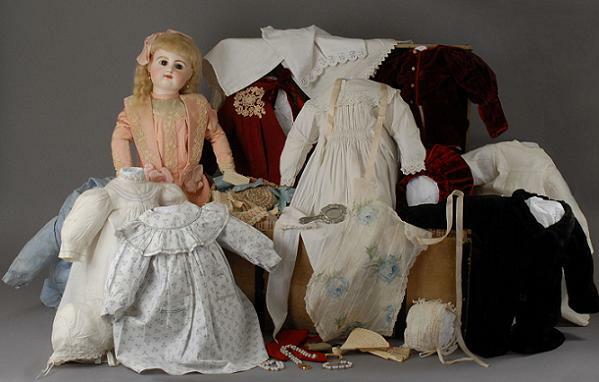 These were the playthings of affluent children, and often came with several sets of clothing, and trunks for storage. 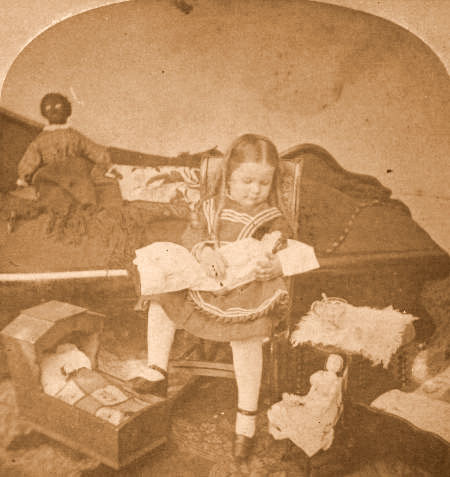 Entire businesses were built upon supplying accessories for these dolls. Kestner Bru 14 for the French market... A perfect socket head with brown glass sleep eyes, amazing modeling and painting – especially to her open/closed mouth and the exquisite teeth. Lovely antique human hair wig. She wears an original chocolate brown wool coat dress with gorgeous hand executed cutwork decoration. 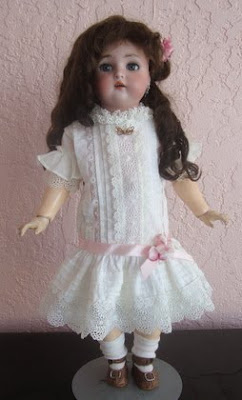 In addition, underneath, she wears a beautifully made white cotton dress that also features cutwork. The final touches include lovely original leather slippers, and a fantastic straw hat. 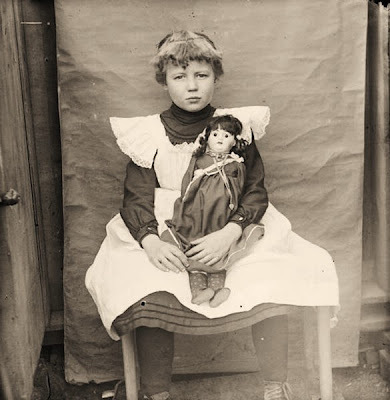 Every country in Europe set out to imitate the French Doll, not always with good results. 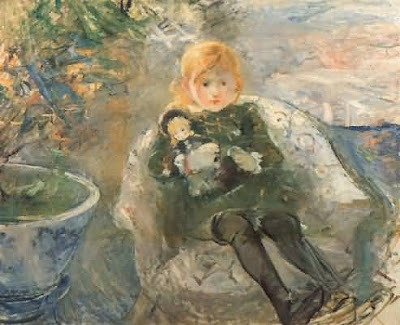 Germany however, had a long history of toy-making and responded to the challenge with the expertise of its craftmen, and economic strength. The German "dolly-faced" child dolls are the ubiquitous antique bisque dolls that collectors today are most likely to find, produced from 1890 to about 1930, from such manufacturers as Armand Marseille, Simon and Halbig, K*R and Kestner. 28" Simon & Halbig child marked S16H 759 DEP. Details of this seldom found character child in an even more seldom found extra-large size include a perfect head with gorgeous bisque tone and painting, early out of the mold modeling, fabulous rich brown paperweight eyes, an open mouth with teeth, pierced ears and a spectacular antique mohair wig in a lovely blonde shade. Her straight-wrist, jointed composition body is in remarkable condition. The dress, in polka-dot and floral-printed chiffon is as fresh as a summer day, and the lace utilized is beyond luxurious. 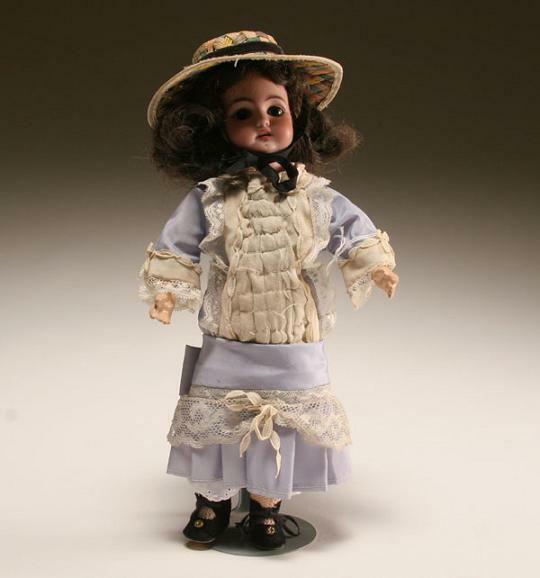 Germany was the highest producers of bisque dolls of all countries, as well as of wax, wooden, china and Dresden dolls. Most of these dolls came from the Thuringia region, which had rich clay deposits used to make the porcelain. Nuremberg, and Sonnenberg were the hub of production for the dolls, before World War I.
Berthe Morisot "Little Girl with Doll"
Original incredibly full blonde mohair wig still in the original set, very large brown sleep eyes, with her full real upper eyelashes, deep deep modeling and lovely creamy bisque-- She is wearing her original dainty lawn dress with very wide lace edged Bertha collar. 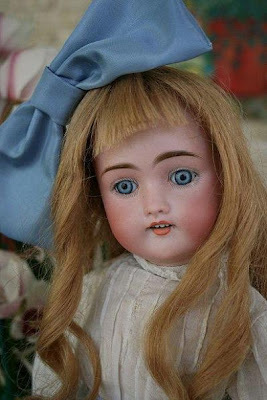 German Simon & Halbig for K * R "Dolly-Face doll"
She has painted plus hair eyelashes and sleep eyes with all of their original eye-wax. She also has four perfect little white teeth. Peaches and Cream Complexion …New pin-tucked and lace cotton lawn dress. The bodice is lined with soft pink cotton to enhance the lace inserts and the skirt is adorned with the pink silk ribbon and flower. Note the tiny vintage pearl buttons on her dress.. She wears a vintage butterfly pin and a vintage silk flower in her hair. 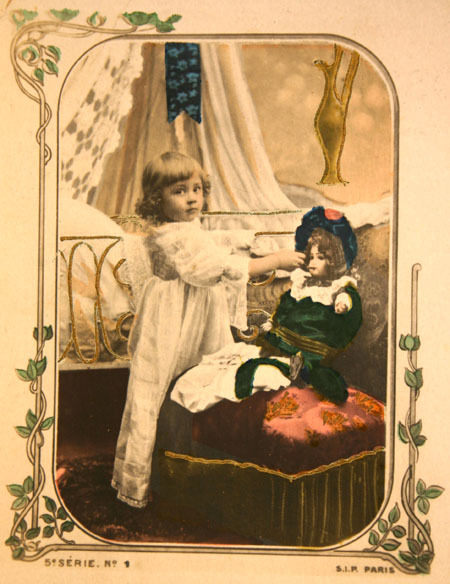 For a long time German bisques were out of favor with collectors, who described them as poor relations to the French bebes. This of course was a shortsighted judgement. The German bisques with socket heads and ball-jointed, strung bodies, are certainly modeled after the style originated in France. But by eliminating everything that was inessential or expensive to manufacture, it was possible to keep prices low, and competitive, and to succeed in markets where French dolls were beyond the reach of most people. 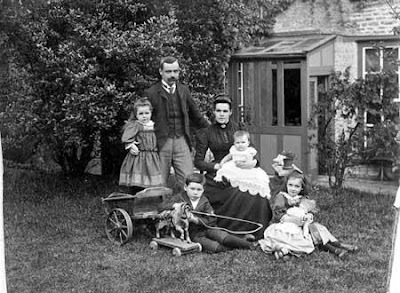 Lady Elizabeth Bowes-Lyon and her brother David, the youngest of the ten children of the Earl and Countess of Strathmore, at the family's county house St Pauls Waldenbury in 1905. 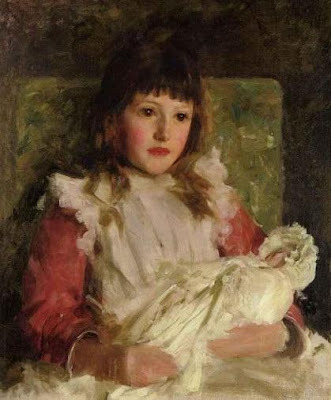 Lady Elizabeth spent most of her childhood in North Hertfordshire and for a while went to school in Hitchin. 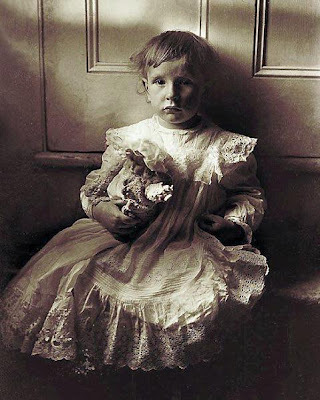 In 1923 she was married in Westminster Abbey to Albert, Duke of York, who was crowned King George VI in 1937 after the abdication of his brother Edward. 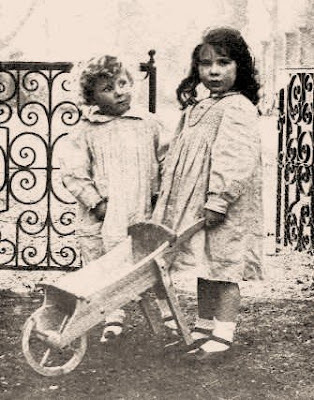 Queen Elizabeth the Queen Mother once recalled that the photograph was preceded by a brief but somewhat heated debate over who was to hold the wheelbarrow. 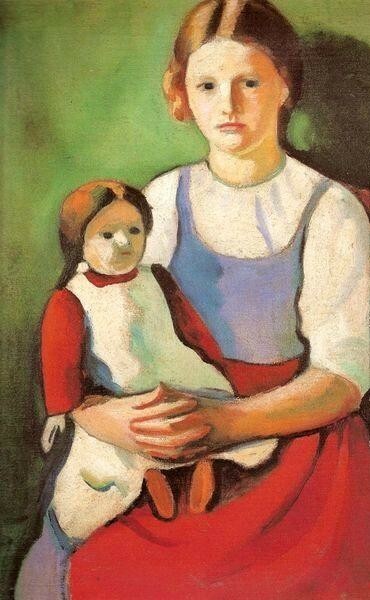 Naturalism was achieved in other directions, by giving the dolls definite characters and expressions. These dolls contrast greatly with the cheaper dolls, whose prettiness seems insipid and whose smiles are vacant in comparison. 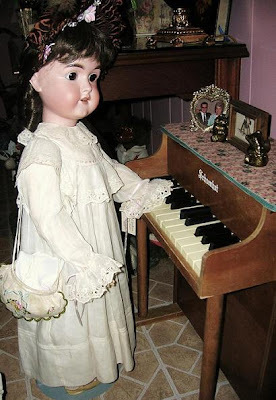 Manufacturers like Kammer & Reinhardt and Heubach & Kestner made highly realistic looking dolls, multiple movements eyes, inset eyelashes, open mouths with teeth, sound boxes and walking mechanisms were all introduced in order to create a more life-like toy. 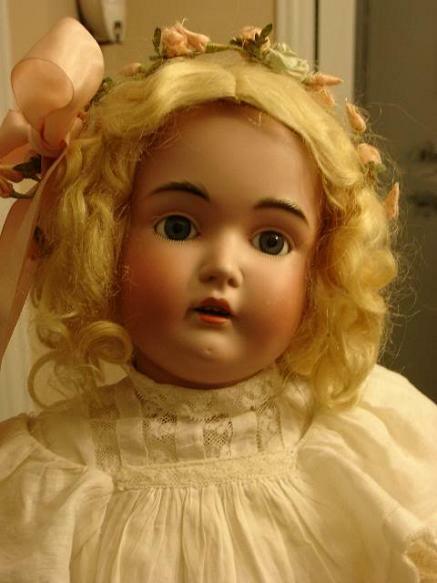 Sammie is a very big boy – a sweet 211 model in size 20, which is actually the largest baby available from the J. D. Kestner company. He measures approximately twenty-five adorable inches long. 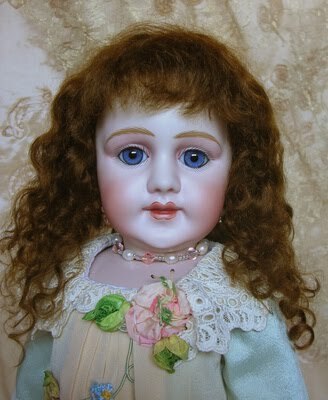 Sammie’s has a perfect bisque head, plus he possesses blue glass sleep eyes, an open mouth with two lower teeth and even his factory original curly lamb wig. Limb baby body is pristine. Christening gown of fine white cotton, with its rows of insertion and tiers of lace. An equally fantastic bonnet is the finishing touch to this young king of Kestner babies. 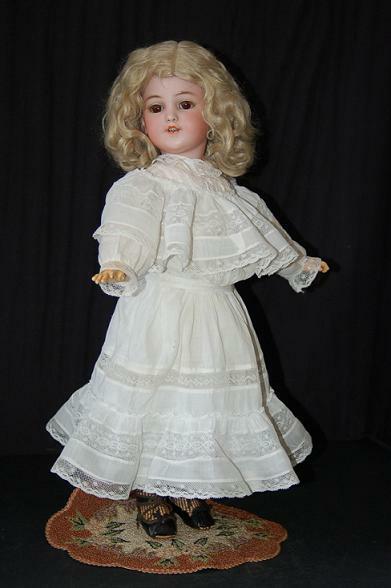 "Marie" - a fine product of the German manufacturer Kammer & Reinhardt, character mold #101 K*R.
In the rare, largest size, measuring twenty-one inches tall, her features include pale blue intaglio eyes, an adorable slightly pouty expression, her original, very full light blond mohair wig and a very beautiful ball jointed composition body. 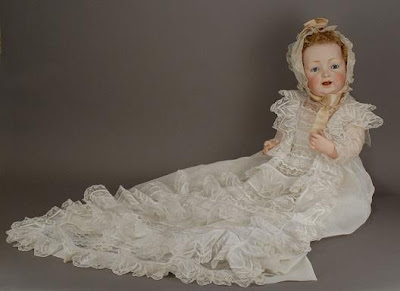 Her sweet antique dress of blue silk, features a frilly white cotton overskirt and sleeves, which are layered with a variety of fine laces and an exquisitely tatted lace bodice. Matching embossed blue silk ribbons decorate the front and are also used as a wide belt, with the same color blue in the fabulous bonnet trimmed in tiny florets, ecru lace and ribbon loops. Her blue silk stockings and cream leather boots are also antique. Popular taste at the turn of the century was inclined toward the photographic and the literal. As a more realistic doll was demanded by children, the old style leather or fabric bodies were displaced by ball-jointed wood and composition limbs, which meant the doll could sit or stand. There were other interesting and imaginative innovations that say a great deal for German inventiveness. For the French market and circa 1890, this adorable 15-½” German dolly face child by Baehr & Proeschild has the incised mold number 261 Dep on her bisque socket head. 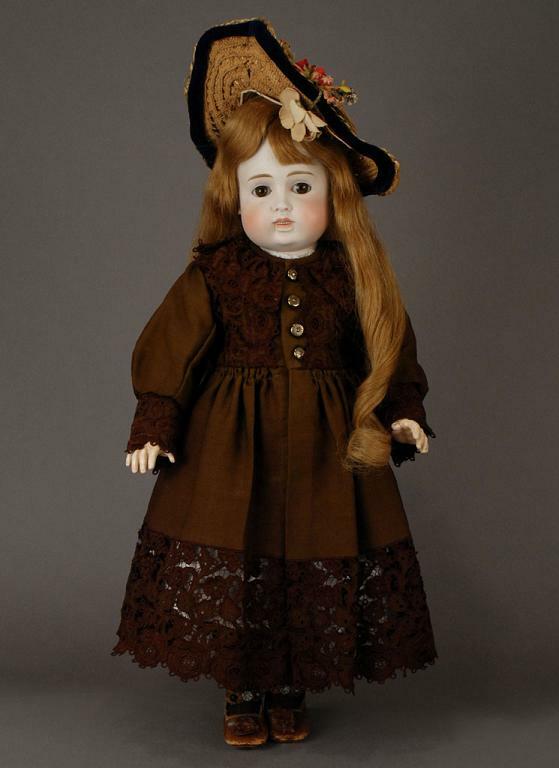 Featuring the fabulous bisque that B & P dolls are known for, expressive cornflower blue glass sleep-eyes, an open mouth with teeth, original blond mohair wig and pierced ears, she is on a ball-jointed composition body. She wears her original detailed factory costume of ivory wool trimmed in fine lace and French blue silk. Her lace-trimmed under things and black canvas shoes are also antique. Today’s collectors, mostly have to rely on their experience in recognizing particular manufacturer’s traits, mainly the artistry of the features on the dolls faces. Some antique dolls made before 1930 have maker’s marks, but unfortunately, the majority didn’t mark their dolls, so the history of these dolls is largely obscured and adding to that fact, other details were literally obliterated by the World Wars. 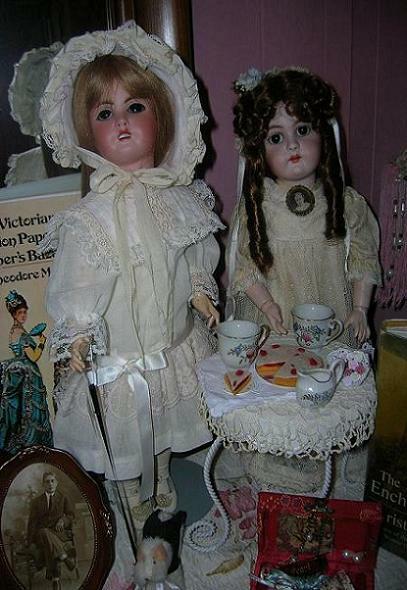 From my own collection: "Tea Party"....Doll on the left is a French bebe by Limoges c. 1915, open mouth with molded teeth newer dress and bonnet appropriate to the period of the doll. 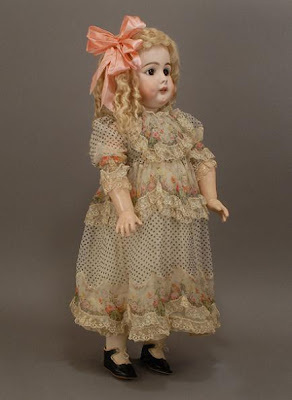 I purchased this doll at the Mary Merritt Doll Museum. 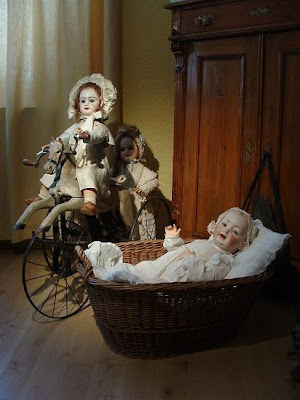 Doll on the right is a closed mouth Heinrich Handwerck ca. late 19th century 1886-92 . All original clothes including her brooch with a little girl's picture, possibly her previous owner. She has unusually large haunting eyes. Closed mouth Kestner, large brown eyes and long human hair wig. Fully jointed Kestner composition body. Fabulous French style ensemble of off white faille with rich lace accents, placket and cuffs in silk cut velvet. A pink silk velvet bonnet completes her world-class look. After the bombing of Nuremberg during World War II, travelers reported that there was not a doll-maker or kiln left. 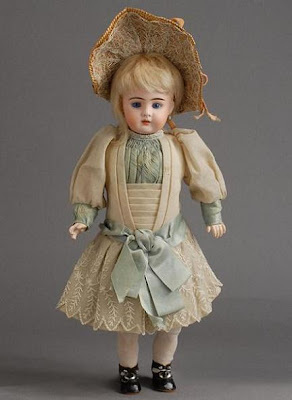 We do know that the majority of German bisque dolls produced before 1880 had closed mouths, and the majority of them produced after 1880 had open lips and molded teeth. This doll is from my own collection...Beautiful brown glass inset eyes, open mouth with molded teeth. Original lawn dress, trimmed with eyelet, and ribbon on collar and cuffs. 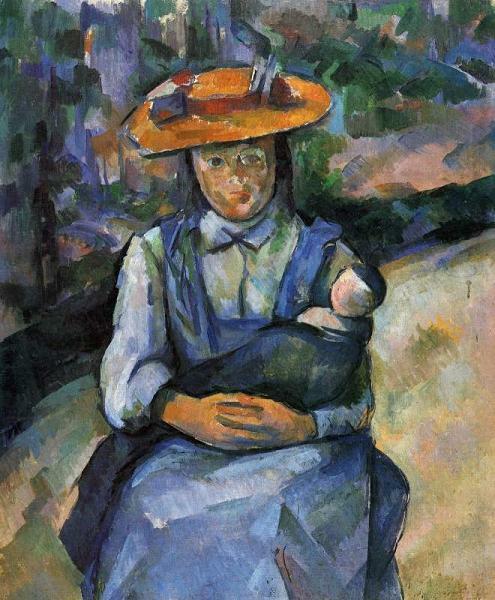 Original oil-cloth shoes and hanky purse. Gorgeous newer bonnet in brown silk. 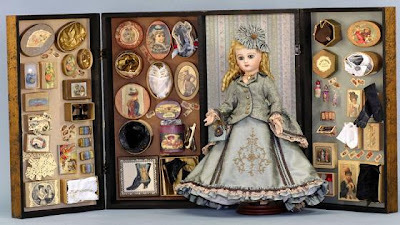 The tariff laws of 1890, which made it necessary to mark all items with their country of origin, makes the collector’s task in identifying early 20th century dolls much easier. 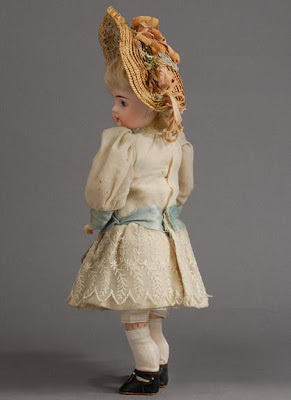 The maker’s mark, model number, and country of origin are to be found on the back of the doll’s head or the shoulder plate… Despite this, dolls are still found with marks that are completely unidentifiable. These mystery dolls have to be valued on their quality and interest, though most conform to the basic so–called “Dolly-Faced” type. Another fantastic post. The pictures you find are - I'm a a loss for words. 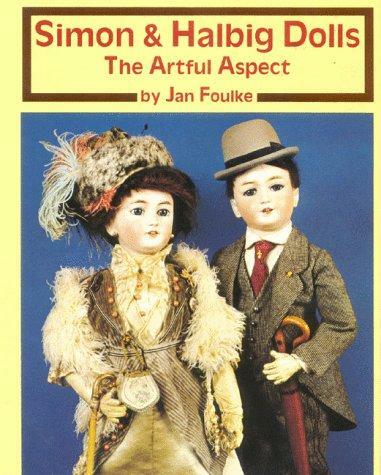 The doll's faces are a little too human for me, but masterpieces of craft. Thank you "Hermes"... 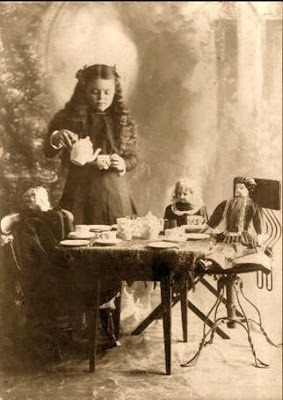 I love the little girl pictures holding their dollies. It's very rewarding to me when I find pictures like that. A lot of people share your feeling for bisque dolls..Too human looking; But the talent that went into creating these treasures is remarkable, and truly a collectors dream to find one in pristine state. 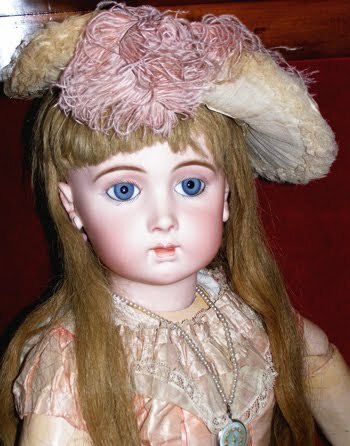 Gorgeous pictures, I too share a passion for antique dolls and old pictures , Your dolls are so lovely and in great condition. Such a lovely display of innocence of time gone past. Thank you for your lovely comment Grace...Its always wonderful to hear from another lover of antique dolls, and times gone by. Preciosas muñecas, Marta. Incluidas las de tu colección. Yo no soy un connaiseur, pero me gusta mucho la morena con tirabuzones y ojos grandes. la "Closed mouth Kestner", "Kara" y la primera con todos esos accesorios. Fascinantes todas esas miniaturas. Y ya sabes que me gustan mucho todas esas ropas. Es asombroso ver que muchas son las originales. Un post muy bonito. Eres una erudita!